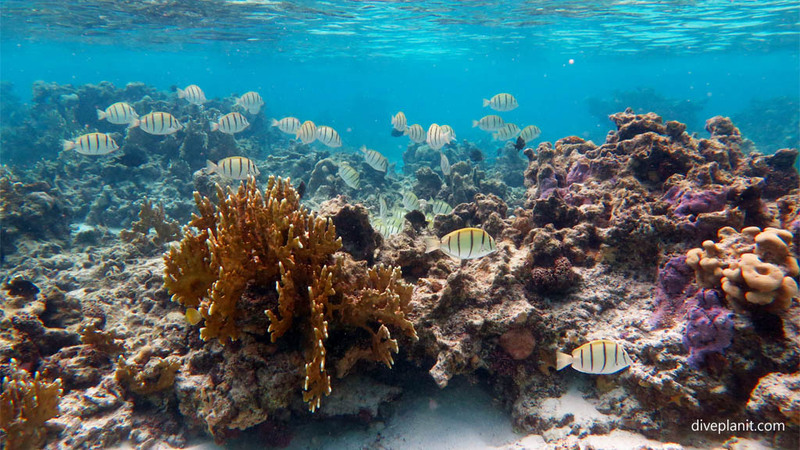 Rarotonga is surrounded by a hard coral reef delivering consistent +30m visibility and brightly coloured reef fish from flame angels to convict surgeons. 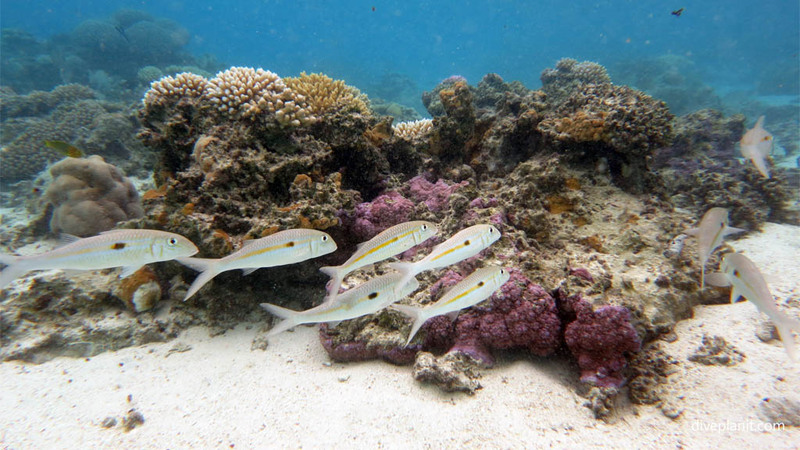 There is also great snorkelling at various places within the lagoon that completely surrounds the island. Rarotonga is the main island of the Cooks and the road which runs around its perimeter is just 32 km long. Avarua is the main Hub, but there is no ‘CBD’ or built up area. Resorts, eateries, activities and commercial establishments are distributed even around the island. 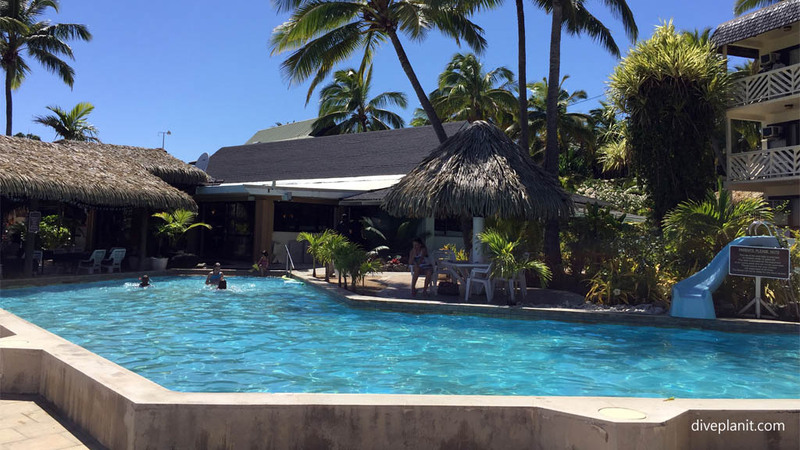 There are no traffic lights, there is no rush hour – Rarotonga feels like a permanent holiday. 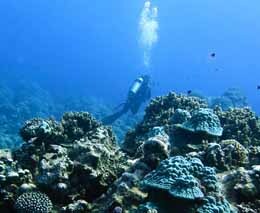 This little video shows what you can expect scuba diving around Rarotonga. Muri Lagoon is a great place to enjoy any number of watersports, and snorkeling is available in the shallow lagoon between the beach and the inside of the outer reef. Some places are better than others – just ask at your accommodation for the best place nearby. Diving is available all around the island via three dive centres who have boats to access all the dive spots. Get in contact with a Dive Centre before you go and book some diving. It’s that easy in the Cooks. Rarotonga is the main island of the Cooks and its international airport is the main entry point for most visitors. It provides air access to the other islands. 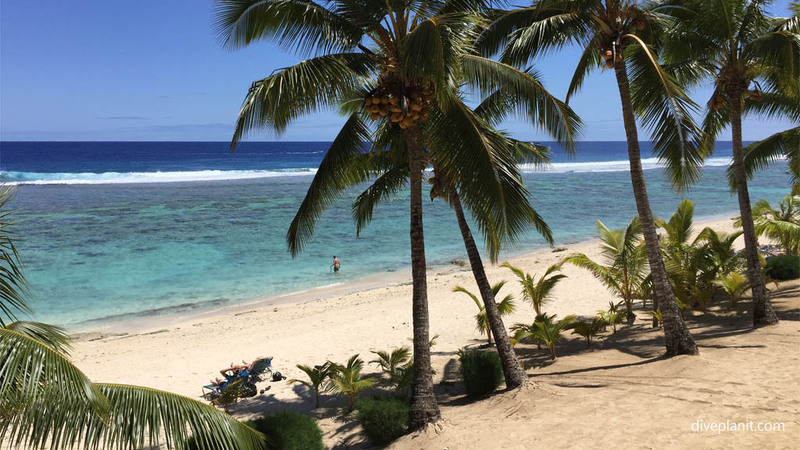 There are three dive centres on Rarotonga, and they are spaced out around the island. 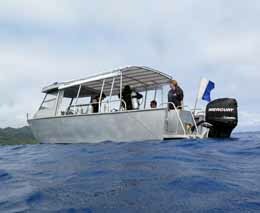 All three have boats and all three know the different dive sites on the outer reef. All three have websites that you can explore, and one of them may even offer free diving try-outs at your resort. Whether you are a seasoned diver, or new to diving, and want a safe, comfortable and exciting dive, check out the Big Fish Dive Centre as your first port of call. 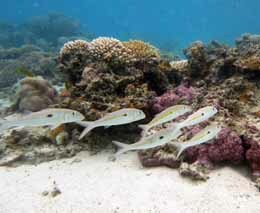 Rarotonga has great dive sites all around it. The operators have the ability to take their boats via trailer to any one of the four launch spots. This means that they can always avoid the rougher sea conditions on the windward side. Firstly, there is the lagoon, where you could probably stay for a couple of hours on a single tank watching the reef fish go about their daily business. 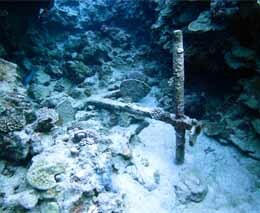 On the outer reef, the sites vary in depths, coral density and terrain. In some places the edge of the drop-off can be accessed at 18m at others 28m. 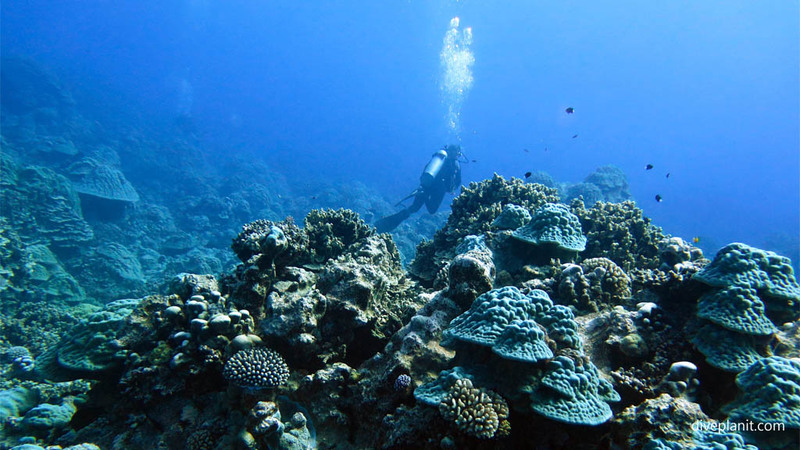 In some places, the porite coral cover is almost 100%, meaning that expert buoyancy control is a must, while others have small or large areas of sand where you can get down on eye level with the marine life. 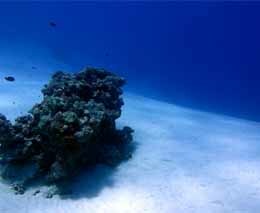 Often the reef top slopes gently towards the drop-off edge, in other places there are gullies and canyons to explore. 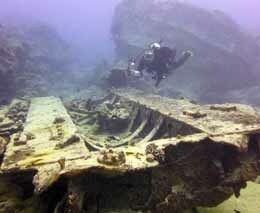 And finally there are wrecks: a number of different and largely well-broken up wrecks are scattered around the north of the island. 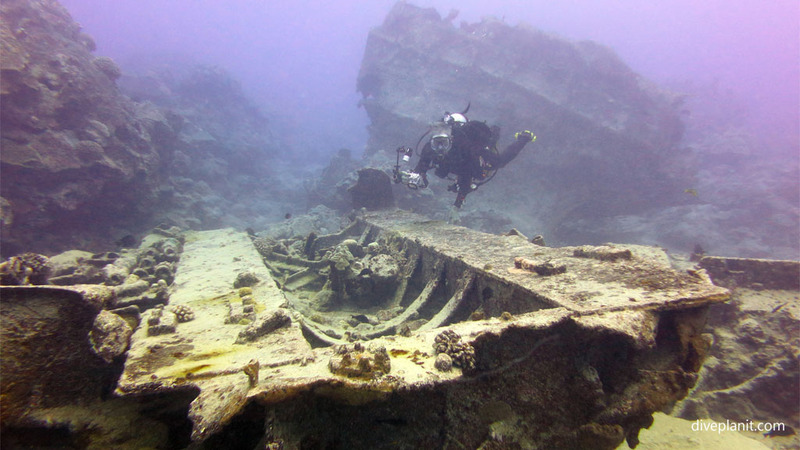 These wrecks also act as artificial reefs attracting more than their fair share of marine life. 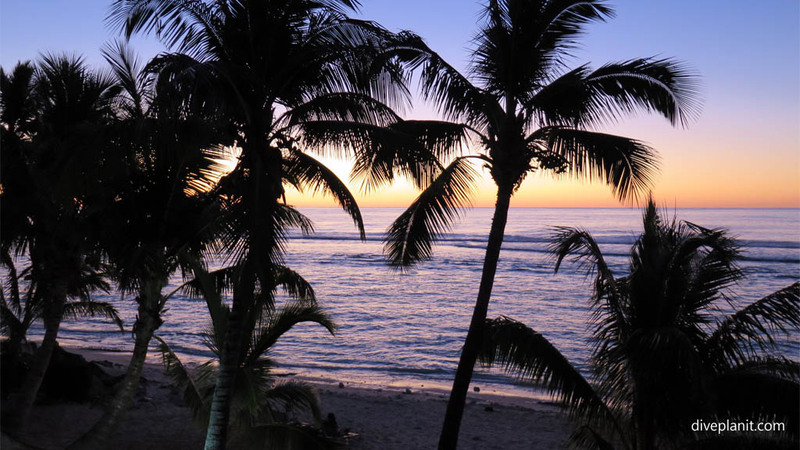 The Rarotonga has everything from five star resorts to self-catering villas and eco-resorts to backpackers. There is something for every budget big and small; and with the island being so compact, location is not so important. The Edgewater Resort has a great combination of both resort style ocean front rooms, and self-contained villas sharing the same facilities: beach, tennis courts, swimming pool bars and restaurants. Which means that you can dine in or out and have a villa to yourself – ideal accommodation for a group of divers who all want to do their own different thing! 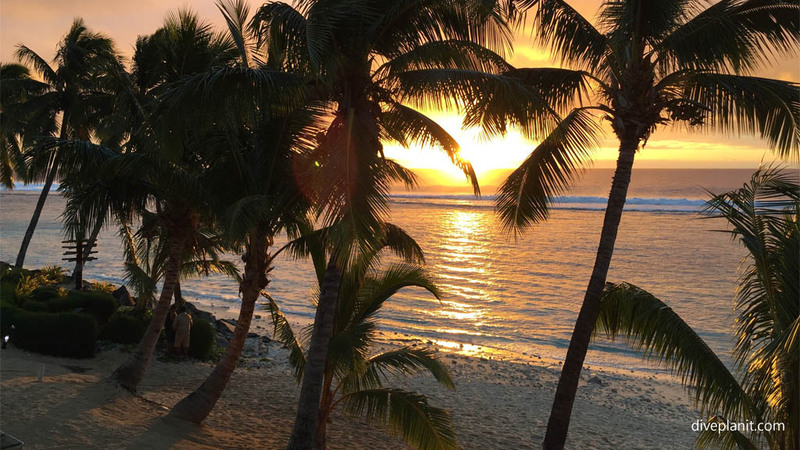 It is also one of the best places to catch the magnificent Cook Islands sunset each evening. Wherever you are staying, the chances are one night or two in a week will be the local dinner feast and show. This presents the opportunity, if you haven’t already taken it, to enjoy some of the very local dishes, see some of the local dancing and hear the drumming of local groups which is performed on hollowed out wooden blocks rather than tight skin drums, which creates a more lively, vibrant sound. 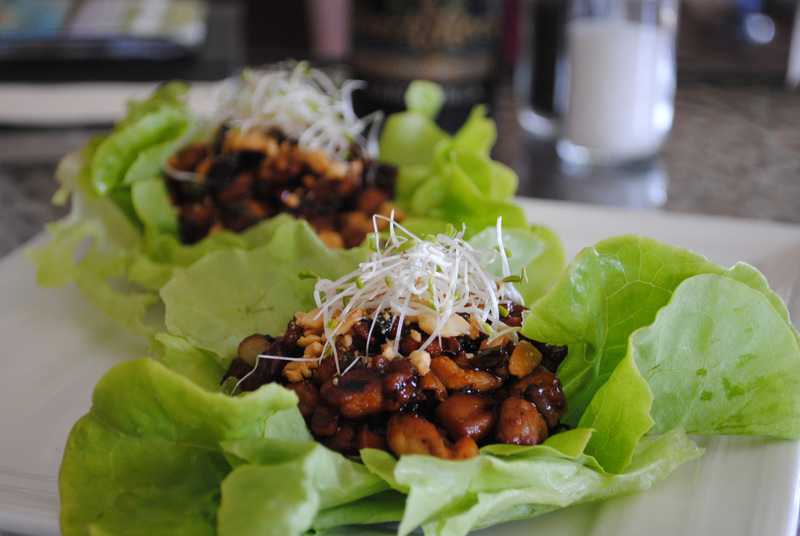 The Tuoro Cafe is open for long lunch six days a week and serves interesting Asian dishes in tapas style, the next dish arriving just as you finished the last. Rounded out nicely with a fine selection of wines and the local Matutu beer it has great views as well as ambience. (‘Fish ‘n’ chips’ and other traditional dishes are also available for those with more conservative palettes). Looking for an authentic takeaway curry? Checkout Mama T’s (over the road from the Tumunu Restaurant). And on a Sunday evening the Castaway Resort has a BBQ where you can have a couple of skewers of meat or fish and salad, and enjoy a glorious Cooks sunset. The island is only 32 kilometres in circumference; so even at a leisurely pace on a motorbike or scooter, you can circumnavigated it in less than one hour. 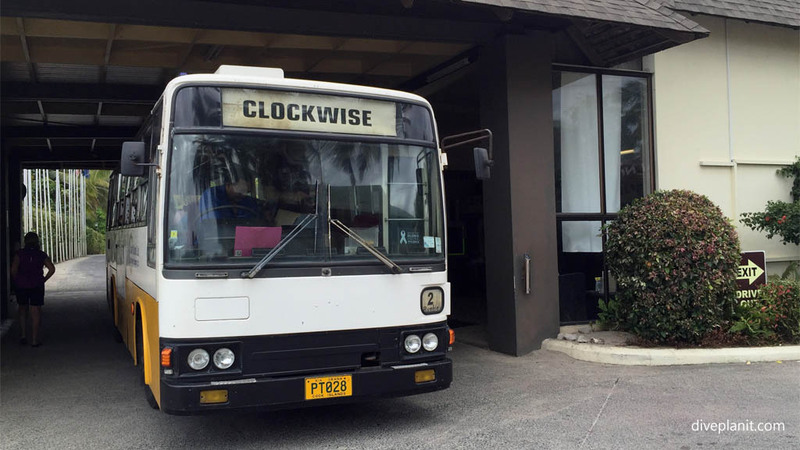 There is a reliable bus service, in fact there are two: One goes clockwise around the island and the other anticlockwise! But we know that divers are notorious for having loadsa gear, so having your own wheels does make sense. It makes even more sense if you brought the family along to have a holiday too. They can drop you at the dive centre and then disappear off and enjoy their day. There are plenty of places to hire from even on an ad hoc basis. Check out Polynesian Rentals – 100% locally owned and operated. 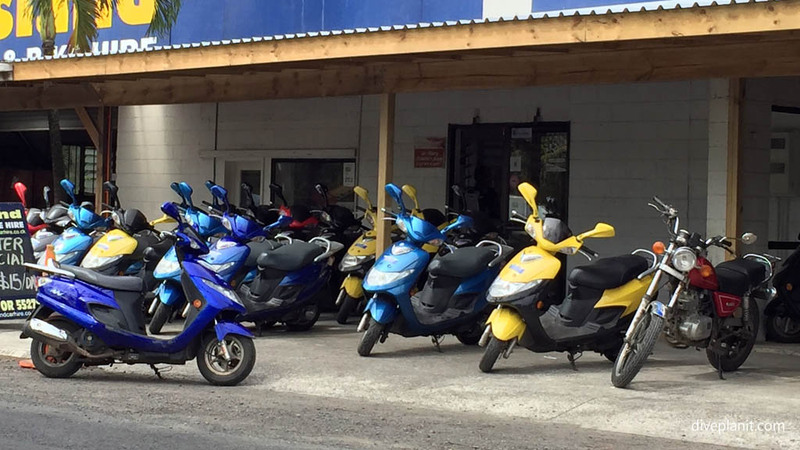 For a more fun way to get around, scooter available to hire for just a day at a time from most accommodations. Of course, if you really want to slow the pace, get a pushbike, or alternatively, explore a part of the island with the Storytellers eco-cycles tour. 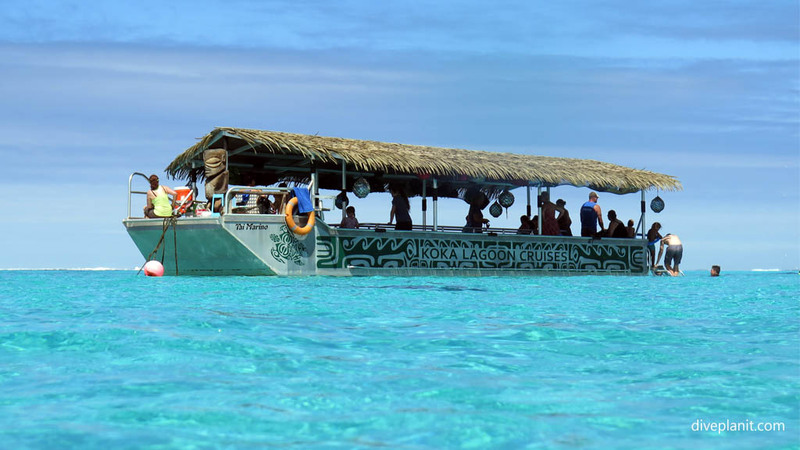 If you’re looking for a cruise, a snorkel, a feed and an entertaining show then the Koka Lagoon Cruises Tour is just for you. During the four hour tour you’ll be entertained by a number of captains: Captain Amazing, the main man, Captain Cook, the chef, and Captain Coconut, the award-winning coconut tree climber and entertainer in general. After a short cruise to the south of Muri Lagoon there is an opportunity for a 40 minute snorkel to see the giant clams, the giant trevally and the colourful reef fish. Guided or unguided. After that we cruise back up to the Koromiri Motu (no touching islet) for a feast of grilled fish, and seasonal salads and fruits. 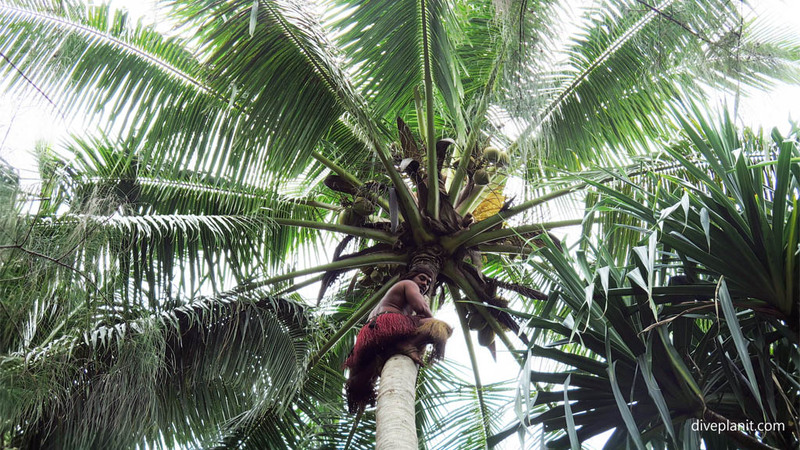 After that you’ll be entertained by the ability of Captain Coconut to scale a coconut tree and then learn how the juice and flesh of a coconut change over time as a nut is prematurely pulled and later falls of its own accord, from the tree. Also learn how to tie the sarong in six different ways before being serenaded back to the boat and across the lagoon back to your waiting bus. But you don’t necessarily need to go on a day tour to enjoy the water. 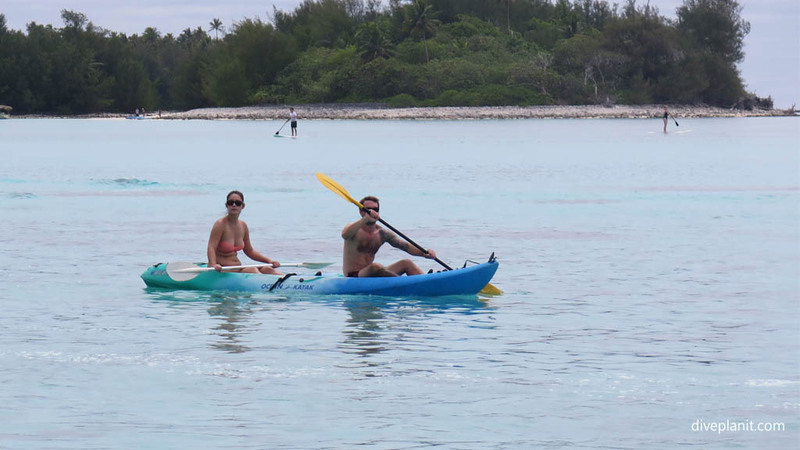 Grab a mask, a set of fins and a kayak and explore the lagoon yourself. There are also inland tours including Storytellers Eco Cycle Tours where you can see the sights, experience culture and enjoy lunch and a swim on a guided cycle tour suited to your experience and ability. The big blue trigger fish appears to have taken on the role of reef mascot in much the same way as certain GBR dive sites have a large friendly Napoleon Wrasse who comes to welcome divers, checks in with them periodically during the dive, and poses for publicity photographs with them etc. Apparently there was one such Blue Trigger who has been around for 30 odd years but who passed away only to be replaced by a new one. 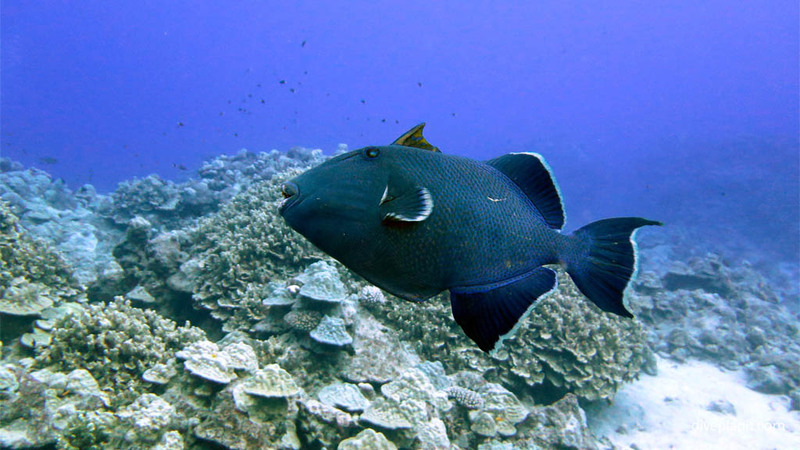 Male triggerfish are very territorial and will patrol an area containing differing numbers of females, according to species. They are not inherently aggressive, but will come around patrolling their territory, which might look like they have come to interact with divers. So, neither friendly nor aggressive, they just come by to ensure that eventually you do get back into that boat and out of their territory. 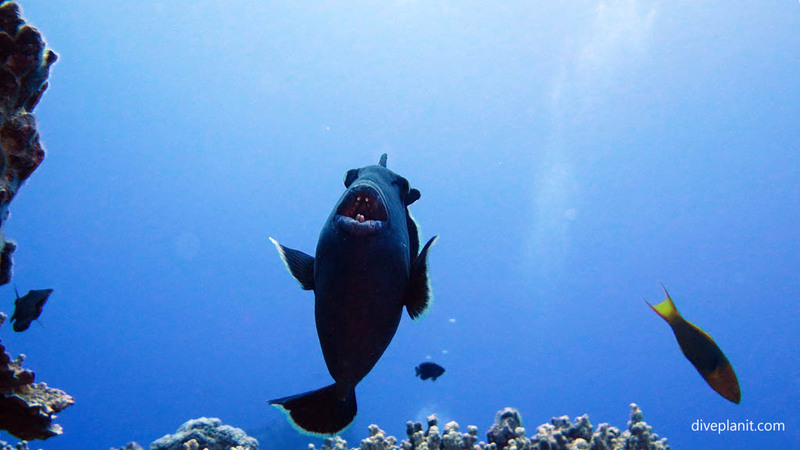 It is the female triggerfish who will act aggressively when they are trying to protect their nest and you unwittingly stray into their demilitarised zone! (This zone is actually an inverted cone directly above the nest, so if you find yourself being ‘accosted’ swim down and away, not up and away!